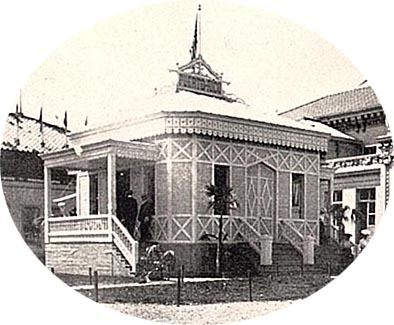 The Puerto Rico building, termed "Porto Rico" in Exposition documents and newspaper stories, was located in the southeastern section of the grounds set aside for the state and foreign buildings. A tiny building that guidebooks called a kiosk, it was one story, 42 x 78 feet, with a cupola 55 feet high. It was "constructed entirely of native woods of all varieties, its floor being of hard wood tiling" (Rand McNally) and had been built on the island, knocked down for shipment, and reassembled in Buffalo. The exterior colors were light and bluish green. There was no glass in the windows; shutters closed them at night and one newspaper said it was one of the coolest buildings on the grounds. Inside there was just one room and a kitchen. Because of its size, it was used primarily as a reception room, where women served Puerto Rican coffee to visitors as a promotional gesture. "A cup of fragrant coffee is served to every visitor who desires it." (Buffalo Express) There was also a cigar stand. The commissioners in charge of the exhibits, displayed in the Agriculture and Manufacturers buildings, were Senor Don Jose T. Silva, Senor Dr. Don Joses Gomez Brioso and Maj. Gen. George W. Fishback. (Puerto Rico was one of the lands acquired from Spain at the conclusion of the Spanish-American War three years earlier).